Nearly a hundred small artifacts, some dating back to the time of the pharaohs, have gone missing from a museum in southern Egypt, officials said Wednesday. The Ministry of Antiquities said 96 artifacts, mostly small figurines and beads, disappeared from the Aswan Museum’s storehouse. Employees noticed a number of artifacts missing, the statement said. A committee looking into the objects’ disappearance checked the storehouse’s inventory and found that the lock on the inner door had been broken. Officials in Aswan said the disappearance was a first for the museum, which hasn’t experienced the thefts that have plagued some other museums around the country throughout the unrest of the past three years. They said evidence pointed to an insider theft. They spoke anonymously as they weren’t authorized to brief the press. Egypt’s ancient treasures have suffered during the aftermath of the uprising that toppled former president Hosni Mubarak in 2011. During the 18 days of protest that led to Mubarak stepping down, 51 pieces were stolen from the Egyptian Museum in Cairo, located on the edge of Tahrir Square, the center of the uprising. Some have been recovered. 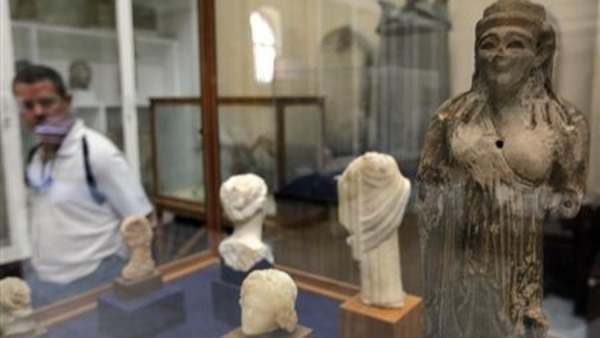 Not long after Mubarak left office on Feb, 11, 2011, a Jordanian man was caught trying to smuggle as many as 3,753 artifacts including pharaonic statues, Roman coins, and medieval jewelry out of the country, according to earlier statements by Interior Ministry officials. There have also been a number of break-ins at antiquity storehouses around the country. In one of the largest thefts, in the city of Qantara on the Sinai peninsula, roughly 800 artifacts were damaged or stolen, with some subsequently recovered. Located next to ruins on the tip of Elephantine Island in the Nile in Egypt’s southernmost city, the Aswan Museum holds artifacts from the southern region of Nubia.